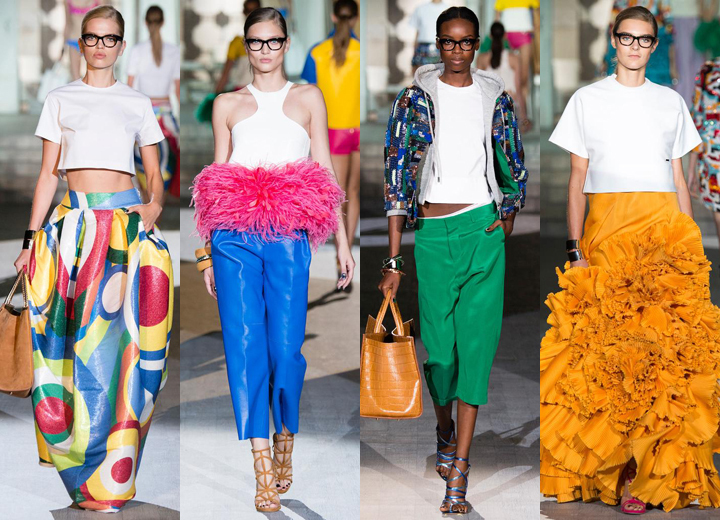 Bright colors, feathers and structured silhouettes, Dsquared2 show was pure magic. Their lady goes from tomboy to classy and chic, but always keeping a little bit of a sporty vibe, that creates a sophisticated laid back look. For what is more, their show is always so incredibly well made and you can tell they are simply having fun, which definitely reflex in their work, that you can not not like! That Karl Lagerfeld is a genius is no secret and this Fendi collection is definitely a proof of how brilliant his mind is. One of the first words that come into my mind, when looking at this collection is word "young" including cropped jackets, structured skirts and lots of feathers. I especially like the materials, color palette and the prints of this collection as they manage to make each and every look impeccable and simply perfect. From bright colors and strong prints, Ports' collection is a little bit more settled and simple, but that doesn't make it any less interesting or chic. The color palette might not be as strong or representative, but the shapes, cuts and materials speak for themselves, delivering a collection for modern, strong women. Last but definitely not least- Roberto Cavalli. One of the things that I especially love about his new collection is diversity. The collection goes from sunny vacations to night out in the city, from bright, summery dresses and romantic white lace to strong and structured leather pieces. He somehow managed to merge so many different styles, but yet delivered a cohesive collection in which I believe each and every woman will find a piece that she likes.